Fred is truly a renaissance man having expertise in numerous areas. Received his Masters Degree from Loyola University. He is a retired Chicago Teacher. Recipient of Superintendent's Quest for Quality Award 1977, Fred participated in the l985-86 "Teacher in Space Program." Fred is also an accomplished actor having done stage, screen and TV and can currently be seen in an American Cancer Society commercial. 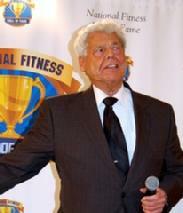 As an athlete Fred is well versed winning the Mr. Chicago title in 1958 and Mr. Universe over 70 in 2003, with many titles in between. He lettered in shot put in college and had an extensive weightlifting career beginning with the National Weightlifting Champion 1958 to becoming the World Masters Champ in 1988 (Of course with many titles in between). Fred was married to his lovely wife, Kathleen over 29 years before her untimely death from cancer. They have three children (oldest son Richard was member of the '88 & '92 US Olympic Team) and six grandchildren.